It’s near enough impossible to get by without a smartphone these days – so it’s worth having the best phone you can buy. In this guide, we’ll be running through the best phones on the market, what they’re great for, and who they’re best for. We’ll also explain the specs you should be looking for in a new phone, as well as talking about the brands, operating systems and the best deals you can get on each phone. Huawei P20 Pro – Three AI-powered cameras, but sadly not available in the US. If you’re not sure what you’re looking for in a phone, find out how to choose the best phone for you. Which are the Best Smartphones to Buy? Of course, a simple list can only tell you so much. So read on to find out exactly why we think you should fork out your hard-earned for these phones, in particular. We’ll explain the phone camera specs, screen quality and speed, amongst other features to help you decide which phone is right for you. We think the Google Pixel 3 XL is the best phone you can buy right now. While its exceptional cameras often grab the headlines, it’s also a beautifully judged phone all round. It has a unique design, combining different glass finishes to create pleasing gloss and matte finishes for different parts of the phone. Its big ‘notch’ at the top of the phone is certainly distinctive (though not to everyone’s tastes). Being a Google phone, it uses a stock version of Android. That means zero manufacturer bloatware and instant access to security and feature updates. The Pixel 3 XL also utilizes Google Assistant brilliantly. The speedy performance is impressive, too, thanks to a Snapdragon 845 processor and 4GB Ram. The Pixel 3 XL’s 6.3-inch OLED display is bright, sharp and excellent for playing games or watching TV shows and movies. While you can’t add a memory card, you do get free unlimited Google Photos storage. Plus, Google Assistant is excellent at helping you optimize files to free up space. And the cameras? They’re the best on the market, bar none. Samsung’s Note series of phones has always sought to give users of everything, and this latest Note 9 version is no different. It packs in a whopping 6.4″ edge-to-edge display, a mammoth 4,000mAh battery and 128GB storage as standard with the option to add up to a 512GB micro-SD card. However, the Note 9 has brains to go with its brawn. Its signature stylus, known as the S Pen, has evolved from a simple note taking implement to a Bluetooth-connected smart stylus than can control your phone from afar. Its two rear cameras also feature the same adaptive sensors as the S9 and S9+, which adapt to the lighting conditions around you, ensuring more detailed snaps. While its Bixby smart assistant can’t match Google Asssitant, the Note 9’s huge feature set mean that it is well worth the near-$1,000 asking price. It’s probably the best ‘big’ phone on the market. While its bigger brother claims the top spot, the regular Pixel 3 is far from a bad phone. In fact, it carries over many of the XL’s excellent traits. It borrows the same design language with a textured glass and metal construction although, unlike the XL, it opts for a bigger top bezel rather than a notched screen. It also uses the same processor, and has the same amount of Ram — so there should be no performance drop off from the larger phone. The exceptional cameras are retained from the XL and it uses the same Android 9 operating system and excellent integration with Google Assistant. In fact, the only area you really lose out (beyond the smaller screen) is in the battery stakes. The regular pixel has to make do with a 2,915mAh unit, compared to the 3,430mAh one in the XL. This means you’ll likely see slightly shorter battery life. The Mate 20 Pro is the latest excellent phone from the controversial Chinese tech giant and with its mind-boggling specification list, it is a serious contender for the best Android phone out there. Its three rear cameras, with lenses supplied by German camera giant Leica, take exceptional shots from a range of distances in a variety of lighting conditions with help from the Mate 20 Pro’s AI smarts. The large 6.4-inch screen is pin-sharp, and will make watching TV shows and movies a dream. There’s also an innovative in-display fingerprint reader and facial recognition for speedy authentication. Its powerful Kirin 980 processor gives a variety of AI benefits and makes multitasking a piece of cake. However, you’ll be hard-pressed to get your hands on one in the US. No major carrier currently offers Huawei phones and, if you can find a way to import one, you’ll need to have deep pockets thanks to its $1,200+ asking price. If value for money is your biggest concern, the OnePlus 6T is almost certainly the phone for you. It manages to combine flagship specifications, including the Snapdragon 845 processor, large AMOLED display, dual cameras and a big battery with a mid-range price tag. The 6T even includes an in-display fingerprint reader, face unlock and a tiny ‘teardrop’ notch, so you can make the most of its fantastic display. So why’s it so cheap? OnePlus’ engineers have gone big on specs, and cut back (slightly) on materials. It doesn’t have a waterproof rating and isn’t capable of fast-charging, for example. However, it’s still brilliant value for money. The iPhone XR is, unofficially, the new ‘cheap’ iPhone. However, at $750, it’s not exactly a bargain. But in our opinion, it’s a better choice than the bigger and pricier XS Max. Firstly, the XR actually offers something different. It comes in a variety of colors not seen since the much-loved iPhone 5C, which launched back in 2013. This gives the XR a unique look and makes it a refreshing change from Apple’s typical monochrome design language. Secondly, by being cheaper, the XR actually offers something different to the XS and the XS Max in particular. It keeps many of the headline features from the XS, with no significant downsides. The LCD screen is perfectly fine, and its 6.1-inch screen will suit more people than the unnecessarily-large 6.5-inch XS Max. Check our full guide, Which iPhone Should I Get? The XS Max is the largest and most expensive iPhone ever and, frankly, we’re not sold on it. That doesn’t mean its a bad phone, but we think you’d be better off with the XS. Its larger 6.5-inch screen is super sharp, just like the XS’. It uses the same cameras as the XS. It has the same processor as the XS. It does have a larger battery, though, but at 3,174mAh it’s hardly market-leading. All told, the XS is a great phone, but paying an extra $100 for 0.7-inches of screen doesn’t seem worth it. We think you’re better off getting the (still plenty large) iPhone XS, or saving and getting the brilliant iPhone XR. First things first, you can’t buy the Huawei P20 Pro in the US. This is due to US carriers refusing to stock the Chinese phone due to security concerns about Huawei. If you’re not in the US, however, you’ll have access to a fantastic phone. The standout feature is the unprecedented triple cameras. These cameras let you take remarkable wide-angle and detail photos effortlessly thanks, in part, to the AI system that automatically detects what sort of photo you’re taking and adjusts settings on-the-fly for the optimal shot. It’s expensive, however, but given the sheer amount of hardware you’re getting, from the triple cameras to the 6.1-inch AMOLED screen and huge 4,000mAh battery, it’s certainly worth the investment. Phone Cameras – This is a hugely competitive feature in this Instagram-age of ours. The best cameraphones now often have two (or even three, in the case of the Huawei P20 Pro) cameras that work together to take great shots. Phone Storage Space – Most phones now offer at least 64GB of internal storage, with some offering up to a whopping 512GB. iPhones get access to Apple’s iCloud storage which allows 50GB storage for just 99 cents a month. Memory Card Slot – Most Android phones, though notably not the Pixel 2 and Pixel 2 XL offer support for microSD memory cards. These can double or sometimes triple your available storage for $20-30. 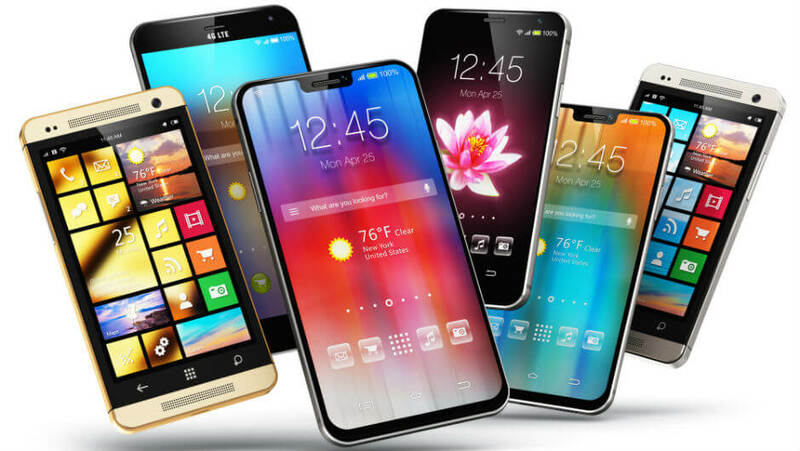 Screen Size – Phone screens are bigger than ever, with some topping 6” diagonally. However, many recent large phones have avoided feeling unwieldy by removing bezels and adopting the tall, but narrower, 16:9 aspect ratio rather than the traditional 3:2. Screen Quality – Typically, the higher the screen’s resolution, the better the screen will look. However, there’s more to screens than just the pixels. Whether the screen is an OLED or LCD, for example, will impact screen quality. iOS vs Android – or Apple vs Google. iOS gives you better integration with other Apple devices and typically better security, but you have less control and customization. There are more Android devices to choose from, and you have more control over your OS, but the experience isn’t quite as slick as iOS. Phone Battery Life – Batteries are measured in mAh, and the higher the number, the bigger the battery. Most top phones can typically last between a day and a day-and-a-half of typical usage.